Spring invigorates parks and gardens always bringing joy and desire to spend some time outdoors. In Florence the charm of some gardens remains the same throughout the year, that's why we at the Residence Hilda would like to recommend our guests a tour in the beautiful Oltrarno district ... 'through gardens'! We'll deliberately skip the famous and stunning Boboli Gardens, a landmark of the Oltrarno district and Florence itself; instead we want to tell you about some less known places, sometimes more intimate, but certainly not less valuable. Let's start from the highest point, the Roses Garden at Piazzale Michelangelo's feet, which offers a breathtaking view over Florence and where one usually takes pictures from the worldwide most known perspective. In the past this garden was opened to the public only for a short time in spring, nowadays you can access it every day from 9am until sunset. Few know that the Roses Garden can count about 1000 botanical varieties with as many as 350 kind of roses, and you can find inside a Japanese garden too. Descending from the Roses Garden towards the river, you can walk along the Lungarno Serristori and enter the vast Terzo Garden, overlooking the river Arno, in recent years subject to a huge urban regeneration work and biodiversity enhancement. 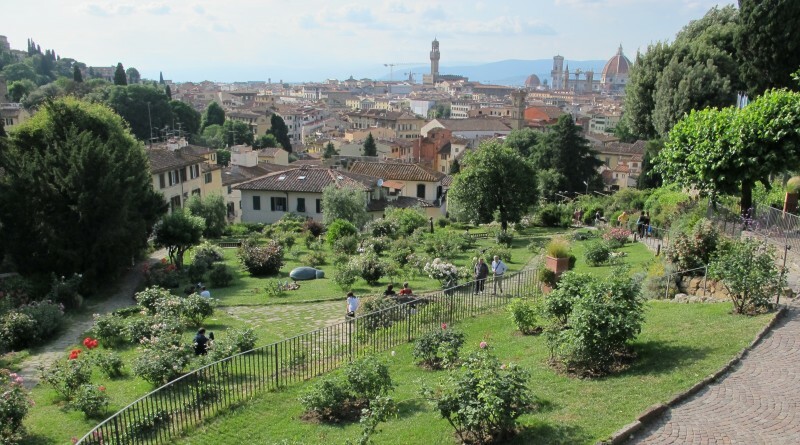 After that do not miss a visit to the nearby and wonderful Bardini Garden, near the eponymous Museum, which covers a large hilly area descending from Fort Belvedere and Piazzale Michelangelo to the Arno river. Its main characteristics are the terraces and the baroque staircase that ends in a small 'belvedere' building where you can enjoy another breathtaking view of Florence. Finally, we would like to present you a real gem, unknown to most tourists and visitors. Still remain in Oltrarno and you can find one of the few large green areas remaining within the ancient walls of Florence, as well as the largest private garden in Europe: the Torrigiani Garden. It is an excellent example of early nineteenth century romantic style garden, it is also famous as a botanical garden and for its "torrino", the small central tower 22 meters high with a library and astronomical instruments inside. This garden is private, the owners (the Torrigiani family) are still living in it, and a visit to the garden must be agreed with them.